Both The Economist and Alvaro Vargas Llosa have looked at Brazil's desire to become a world-class diplomatic power and become a permanent member of the UN Security Council--and, how last week's visit by Mahmoud Ahmadinejad played in this ambition. 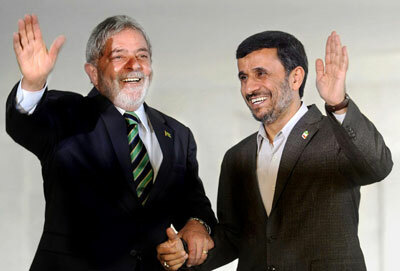 Neither one is favorably impressed with the fact that Lula invited Iranian President Mahmoud Ahmadinejad for a state visit. One must emphasize that it was a state visit, not simply a visit by a delegation of 200 Iranian businessmen, and a state visit that was rescheduled after the initial outcry last May. President Lula frequently talks about how important democracy is, and members of his government invoke their experience of exile or imprisonment at the hands of Brazil’s former military government. This sits awkwardly with reports that Iran’s government has sentenced to death five opposition activists since the protests that followed its disputed election. Brazil, a bewitching country, needs to take a deep breath. Its ambition ought to be focused on reforming its political system so prosperity can be something more than a combination of high revenue from commodities and some manufactured products, and social programs such as Bolsa Familia, a subsidy distributed to about 11 million poor families. The leaders need to tame their hubris before it pulls too far ahead of reality. A question that perhaps Brazil's leadership ought to have asked is, how does a state visit from Ahmadinejad sit with the permanent members of the UN Security Council--China, France, Russia, the US, and the UK? Of the five, the only one that perhaps considers the state visit in a favorable light is Russia. Combined with the misstep on Israeli-Palestinian relations, the hosting of deposed Honduran President Mel Zelaya in the Brazilian embassy in Tegucigalpa, and Iran's status as a state sponsoring terrorism along with its nuclear ambitions, one can only surmise that the country is not quite ready for that permanent Security Council seat.